Mumbling a curse word. Discharging a can of fart spray. Pouring chocolate milk on a classmate’s head. All have happened in Washington schools in recent years and have resulted in intervention by police. These behaviors are juvenile and against school rules, but that doesn’t mean the kids who engage in them should be treated as criminals. to throwing spitballs—could result in arrest. But teachers don’t arrest people, police do, and on Washington school campuses, their presence is larger than ever. Of the 100 largest school districts in our state, 84 have police officers assigned to schools on a daily basis. Even schools without police officers assigned to campus may call police to respond to incidents of routine student misconduct. A new report by the ACLU of Washington, “Students, Not Suspects: The Need to Reform School Policing in Washington” shows that current laws and policies in Washington provide little guidance for the use police of in schools and explains how police presence on school campuses undermines the education of Washington public-school students. Regular law enforcement presence in school leads to higher rates of student arrest, particularly for low-level issues like disorderly conduct or disturbing school, even controlling for other variables like neighborhood violence and demographics. Moreover, in Washington, both school administrators and school police generally have wide latitude to involve police officers in student discipline matters. The ACLU reviewed court data from the past 20 years and found over 800 cases where a juvenile was charged with disturbing school. Arrests have terrible consequences for students. A first-time arrest doubles the odds that a student will drop out of high school, and a first-time court appearance quadruples the odds. One study found that only 26 percent of students who were arrested graduated from high school, as opposed to 64 percent of their peers; arrested students were also half as likely to enroll in a four-year college. Young people who drop out of school in turn have lower income and lifetime earnings than their peers. Juvenile arrest also increases students’ chances of future imprisonment: young people with an arrest record are subject to greater surveillance and harsher discipline from police and other adults that significantly increases their chances of arrest. school police—whether or not they entered the United States with legal status and whether or not they are charged with or convicted of a crime—could face the harsh sanction of deportation or inability to naturalize as U.S. citizens. In addition, there is evidence that all students suffer in highly punitive or policed schools. Students in schools with “zero tolerance” or other harsh discipline policies report feeling less connected, less trusting, and less engaged in their schools. While some police officers do work to build connections between students and police, those efforts are too often driven by an individual officer’s personality. 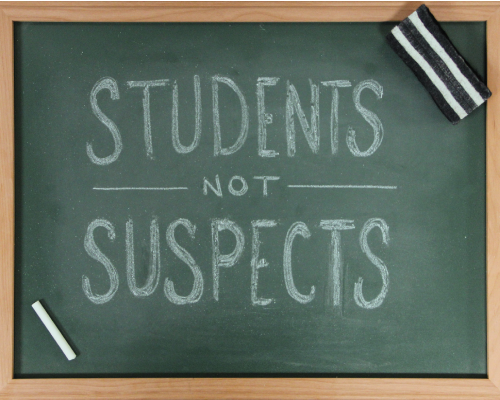 “Students, Not Suspects” concludes that police officers should not be a regular part of the school environment in Washington. Students, teachers, and school staff deserve safe, quality schools, but this cannot be accomplished by reliance on school policing.